TOO MANY TALKING HEADS « THE BRYCE IS RIGHT! 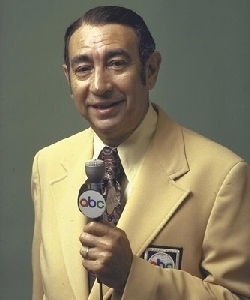 – We should thank Howard Cosell for this. Just prior to Mr. Trump’s inauguration, he placed a wreath at the Tomb of the Unknown Soldiers in Arlington, Virginia with VP-elect Mike Pence. As I happened to be in the office at the time, I watched it on-line through a Fox News feed less the usual background chatter from a reporter describing every detail. Frankly, I enjoyed it immensely and saw it as a dignified ceremony. There were no pesky commercials and no talking heads which I normally find irritating. Throughout the rest of the inauguration, I watched other related events on-line or on C-SPAN, including the parades and balls. Whenever I turned on the television to a commercial channel, I was bombarded by nonsensical trivialities by the news anchors, forcing me to change channels as I had enough of their blather and wanted to watch events on my own. I understand the need for sports anchors to report play-by-play activities over the radio, but I think we’ve gone too far on television where every scratch and itch is scrutinized. Frankly, I don’t need it, nor want it. I blame newscaster Howard Cosell for this phenomenon. Back in the early days of ABC Monday Night Football, Howard loved to hear himself talk when others tried to let the camera tell the story. Cosell’s dialog was so irritating, tavern owners across the country began to run pools; if you won, you had the honor of throwing a brick through the TV set when Cosell’s face first appeared on the screen. This was unsettling to Howard, but he did nothing to change his style as an obnoxious broadcaster. Today, there is a whole new generation of Cosells, not just in sports but in politics as well. Instead of allowing someone to speak, such as a Congressman or the President, there is a tendency to either interrupt the person or talk over what they are saying. The fact I tuned in to see a political figure talk doesn’t mean I want to know the spin of the news reporter. Let me watch the presentation and you can analyze it afterwards, although there is no guarantee I won’t change the channel. Enough is enough. The anchors should learn to shut-up before people tune them out in favor of uninterrupted on-line coverage. If people want to listen to the anchors, fine, let them access it through the SAP button on their remote control. That’s how I feel about today’s talking heads. Thanks Howard. NEXT UP: WHAT THE MARCH ON WASHINGTON WAS ALL ABOUT – It is much more than just female rights. LAST TIME: BASEBALL CARDS – Are they a commodity or a memento of our youth? Listen to Tim on News Talk Florida (WWBA 820 AM), WZIG-FM (104.1) in Palm Harbor,FL; KIT-AM (1280) in Yakima, Washington “The Morning News” with hosts Dave Ettl & Lance Tormey (weekdays. 6:00-9:00am Pacific). Or tune-in to Tim’s channel on YouTube. Click for TIM’S LIBRARY OF AUDIO CLIPS. This entry was posted on February 6, 2017 at 8:00 am	and is filed under Life, Media. Tagged: Florida, palm harbor, The Bryce is Right, tim bryce, TOO MANY TALKING HEADS. You can follow any responses to this entry through the RSS 2.0 feed. You can leave a response, or trackback from your own site.